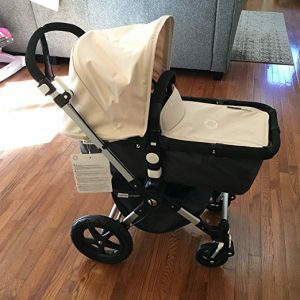 High-end strollers not only look good, but they also provide you with a lot of amazing features that standard strollers just don’t have. Let’s take a look at a few of the best ones out there. If you want a luxury stroller and are willing to go all in, why not start with the best? The UPPABaby VISTA Stroller is an amazing system that expands to support your growing family. The 2018 version has somehow managed to improve upon a system that was already quite impressive, to begin with. There are a lot of cool features that make this stroller the best. Changing the seat’s position is really easy as it goes from forward to rear facing with ease. The reclining mechanism can be adjusted with one hand and goes from full recline to completely upright with multiple stops in between. The handle is height adjustable, which is a great feature for tall parents. And get this: the handle is covered in 100% hand-stitched leather. There’s also a spacious and easily accessible basket where you can stash all the things you need to bring along for both you and your infant. The canopy height is adjustable, and the built-in sunshade keeps the bright light out of your little one’s eye while also providing an SPF of 50. There’s also a rain shield and bug shield included so your baby is protected no matter the weather conditions. This system includes a bassinet, too, which comes in really handy for extended travel or just a night at the grandparents’ house. The car seat seamlessly transfers from car to stroller with a simple click. Plus, when your child outgrows the car seat, you’ll both appreciate the deep seat and long footrest on the stroller. All the fabrics are machine washable, too. Honestly, we’ve only touched on all the things this system has to offer. It is easily one of the most impressive systems ever designed. Next up is the Bugaboo Cameleon3 Stroller. This stylish stroller has the look of an old-fashioned pram with modern features that you didn’t even know existed. One of the coolest things about this is how easily it unfolds. All you have to do is pull up on the handle, and the stroller unfolds itself and falls gently into place. Another awesome thing about this stroller is how easily the wheels adjust to accommodate different terrains. There are two large wheels in the back and two small swivel wheels in front that are perfect for maneuvering into subways, elevators, or through the aisles in the grocery store. For rougher terrain, reverse the handlebar to put the large wheels in front. And get this, you can even lock it into a 2-wheel position if you’re dealing with some seriously bumpy roads. There’s a bassinet included for when your little one is brand new. A car seat adapter is also available if you want to use it as part of a travel system. When your little one can sit up on his own, you’ll both love the versatile seating options. The seat can face forwards or backward and has three recline positions. 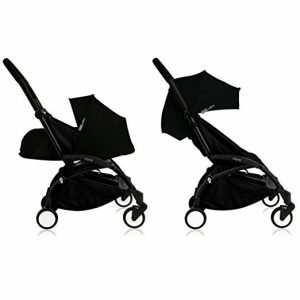 The best thing about the Austlen Baby Co. Entourage Stroller is how versatile it is. Believe it or not, this stroller actually gives you 30 different configurations. There’s an expandable tote and large stow-away storage that can hold just about anything. You will be blown away by how much you can carry on this stroller. 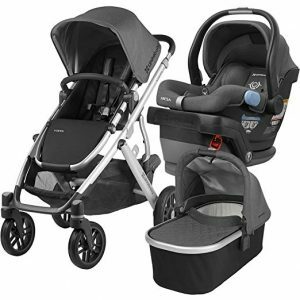 It’s made to hold up to 150 pounds, three times what other strollers can do. With the 1-hand expansion feature, this stroller takes seconds to set up. The seat has five different recline positions, an adjustable footrest, and can be used with double car seats or as a double stroller. Despite being this functional, it also looks classy. The fan-spoked wheels give it an old-fashioned look. The charcoal fabric looks plush while also being machine washable. Plus, the handles are covered in soft-touch vegan leather for a classy, upscale look. The Jane Rider is functional and elegant. One of the things that stands out about it is the fabric. It’s a plush, poly-cotton blend that’s soft and comfortable as well as machine washable. Parents will love the adjustable handlebar. There are six different settings so if mom is short and dad is tall; they’ll both be able to enjoy pushing this stroller. And get this: there’s a rain cover, cup hold, and diaper bag included with purchase. It’s really easy to open, just a simple tap of your foot and it opens up regardless of whether the seat if rear or forward facing. 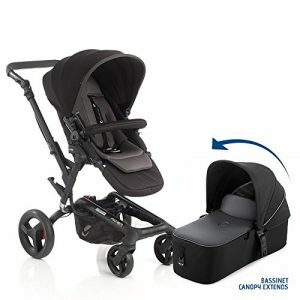 The rear suspension helps your little one tolerate bumpier walks around the park. It’s also perfect for running errands when your baby needs to be able to lay back and take a nap. 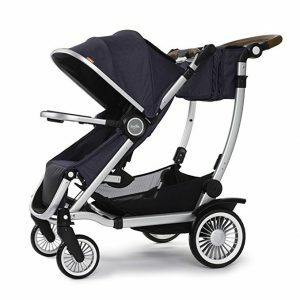 The Babyzen YoYo+ Stroller is a stylish, functional optional stroller system for modern parents. There are even accessories you can add to increase its versatility, so you can use it for years to come. One of the remarkable things about this stroller is that it’s pretty compact. In fact, when it’s folded, it’s small enough to fit inside the overhead compartment of an airplane. Because you can fold, unfold, and steer it with one hand, you can easily shop, take an important phone call, or cuddle your child at the same time. When you’re on the move, the 4-wheel suspension can handle bumpier rides without completely disturbing your baby. This bundle includes the newborn pack which includes a newborn bassinet that attaches to the frame. It has a 5-point harness to keep your baby safe along with complete head support. The pop-up canopy has three positions and provides SPF 50 protection from the sun’s rays. All the fabrics in the system are completely machine washable, too.